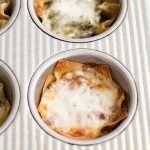 Mini vegetarian lasagna cups with mushrooms, cheese, and sauce are perfect to get big lasagna flavor, without all the work. Preheat your oven to 375°F. Grease one 12-cup muffin tin with nonstick cooking spray. Heat the olive oil in a large skillet over medium-high heat. Add the chopped mushrooms and onion and cook, stirring often, until the onions are translucent and starting to brown, about 7-8 minutes. Stir in the oregano, thyme, and salt. Remove from heat. On a flat work surface, lay two wonton wrappers on top of each other with one rotated 45 degrees, so that the corners are poking out from all around the sides. Place in a muffin cup and flatten against the sides as much as you can. Repeat for all cups. Add a heaping tablespoon of the mushroom and onion mixture to each cup, then top with a tablespoon of either marinara sauce or pesto. Sprinkle with a bit of cheese on top. Bake for about 20 minutes, until the tips of the wonton wrappers are nicely browned and the cheese is melted. Let cool 8-10 minutes before serving – they’re hot!